The Easter Bunny. 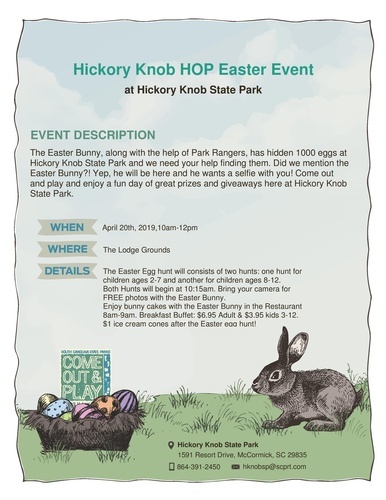 along with the help of Park Rangers, has hidden 1000 eggs at Hickory Knob State Park! Did we mention the Easter Bunny?? There will be two hunts: one for children ages 2-7 and another for children ages 8-12. Both begin at 10:15a.m. Bring your camera for FREE photos with the Easter Bunny!